Aaron Dennison and the Dennison Watch Case Co.
Aaron Dennison was an important pioneer in watchmaking by machinery; in fact it could be said that he was the most important pioneer, in that it was his ideas that started the mass production of watch movement parts by machinery in America, which had major knock-on effects on watchmaking in Switzerland and England. After initiating a revolution in watchmaking, Dennison set up a company in Birmingham, England, to make watch cases, and many collectors will have watches with cases made by the Dennison watch case company. Aaron Lufkin Dennison was born in the USA in 1812, the son of Colonel Andrew Dennison and Lydia Lufkin. His father was a cobbler by trade, but Aaron didn't like shoemaking and had a mechanical turn of mind, so in 1830 he was apprenticed to James Carey, a clock and watch maker, gunsmith and gold and silversmith of Brunswick. In 1833 Dennison set up on his own as a watch repairer, but shortly after entered the employ of Jones, Low and Ball where he learnt from Tubal Hone, then considered to be one of the finest watchmakers in the country. In about 1840 he began to think about manufacturing complete watches in the United States by machine. In 1849 Dennison approached Edward Howard, partner in the company Howard & Davis, with his plan, and a factory was created at Roxbury, Massachusetts for the new firm which, after several initial changes of name, was called Dennison, Howard & Davis. The firm operated until the beginning of 1857 when it went bankrupt. The assets of the bankrupt company were auctioned and the buildings and some machinery were bought Royal E. Robbins, who restarted watch manufacture under the name of Tracy Baker & Company with Dennison superintendent of the mechanical department. Robbins found Dennison to be rather too creative when graft and application was required, and in December 1861 he was dismissed. After Dennison had left, the new cheaper William Ellery model watch he had been trying to introduce became a financial success for the company, selling in large numbers to soldiers during the American civil war. From the rather confusing jumble of company restructurings that followed eventually emerged the American Watch Company of Waltham, Massachusetts, but Dennison was no longer involved in the company he had helped to found. In 1864 Dennison and A. O. Bigelow set up the Tremont Watch Company in Boston with the idea of buying in the small fine parts, such as the balance, escapement and train wheel trains from Switzerland, where wages were lower than in America, and making in America the larger parts, such as the spring barrel and the watch plates, and assembling watches. Dennison went to Zurich to supervise ordering and delivery of the parts to America. The American company ran into financial problems in 1870, and in 1871 Dennison moved from Zurich to Birmingham, England, where he set up The Anglo-American Watch Company to assemble watches using parts he had already purchased in Switzerland and plates ordered from Tremont. These watches were understandably American in nature, with going barrels rather than fusees, and the initial products, uncased movements, were sent to America for sale, but there was little demand because of a financial recession at the time meaning that the market was over supplied already. The name of the company was changed in February 1874 to The English Watch Company, presumably indicating an intention to try selling watches to the British market. It appears that Dennison may have left the company at this time. The change of direction was unsuccessful and The English Watch Company was was wound up voluntarily in June 1875 and sold for £5,500 to William Bragge. The business continued under Bragge and his son Robert until it went into voluntary liquidation on 11 February 1895 and was not resurrected. It is thought that Williamsons of Coventry bought some of the machinery. In around 1874 Dennison set up a watch case manufactory in the Handsworth area of Birmingham which eventually became the Dennison Watch Case Company. The early history of the company is rather unknown, despite the best efforts of Philip Priestley with the help of descendants of the founder to uncover it. A record in the Birmingham Trade Directory of 1876 indicates a possibility that Edward Howard, one of the founders of the American company with Dennison and Davis in 1850, might have been an investor. Alfred Wigley, an engraver, polisher and springer of watchcases, was involved in some way right from the start, eventually becoming a partner in 1879. The company was called Dennison, Wigley & Company from 1879 until 1905. The setting up of the watch case factory in Birmingham coincided with the opening in 1874 of the London office of the American Watch Company by Nelson Pitkin Stratton, who had joined the company in 1852 and been made assistant superintendent in 1857. The American Watch Company of Waltham by this time was mass producing watch movements at a tremendous rate, more than they could sell in America, which like Europe from 1873 had been undergoing a recession, so they looked to export their excess production. One problem they had was that advances in watch case making hadn't kept pace with the mechanisation and automation of watch movement making, and so watch cases were not in the same surplus. This lead them to want to export bare or uncased movements and they then looked to English watch case makers to supply cases to house these. But the English watch case makers couldn't supply the quantities of cases that were needed, so at first Swiss and some American watch cases were imported. In 1878 a Select Committee of the House of Commons was set up to look into gold and silver hallmarking. Alfred Bedford, at the time manager for the American Watch Co. of Waltham in the UK, stated that in 1877 Waltham UK had imported 5,000 cases from the United States and 18,000 from Switzerland. The first major customer for Dennison watch cases was the American Watch Company of Waltham, and the coincidence of the date of 1874 in Aaron Dennison leaving the The Anglo-American Watch Company and setting up a case making company, together with the opening in 1874 of the London office of the American Watch Company looks very significant. The London office of the American Watch Company at Waltham was first opened by Robbins & Appleton, but soon placed in the hands of N. P. Stratton who was directly responsible to the factory at Waltham. Stratton visited Dennison at Birmingham to ask if he would act as representative for the Company in England, but Dennison declined. Stratton then hired his son, Edward B. Dennison, instead. Robbins evidently did not harbour any ill will against Dennison and gave substantial financial assistance to his successful effort to finally establish a business of his own. All the hallmarked gold and silver watch cases made by Dennison to house imported American Waltham movements had the sponsor's marks of either Frederick Francis Seeland, who was manager for the American Watch Co. of Waltham in the UK before leaving in late 1876 to take over at IWC, or the A.B of Alfred Bedford, who took over from Seeland as manager of Waltham UK. It is significant that neither Alfred Wigley's or Aaron Dennison's registered sponsor's marks appeared on the cases they made for Waltham. In evidence in 1887 to the Select Committee examining proposed changes to the Merchandise Marks Act, Alfred Bedford, the General Manager in Europe of the Waltham Watch Company, was asked "Is there not a branch of the American watch manufacture established in Birmingham?" to which Bedford replied "It is the case shop." In answers to other questions, Bedford stated "At our case factory at Birmingham we turn out something like 50,000 cases a year for our watches." (emphasis added) and "We have at our factory at Birmingham received under permission from me orders to make 500 or 1,000 cases ...." (emphasis added). So it appears that Waltham had some interest in the company, and for Bedford to give permission for work to be done he must have had some authority. The "500 or 1,000 cases" that Alfred Bedford mentioned in his evidence to the Select Committee were ordered from Switzerland. Bedford said they were to house Swiss watches and that they had been ordered specifically to obtain cases with English hallmarks. The fact that Bedford gave permission for the order to be filled shows that production of watch cases could exceed the number needed to case Waltham movements at that time. In August 1888 The Watchmaker, Jeweller and Silversmith reported that Dennison & Wigley were making watch cases so successfully as to be able to send quantities to America in spite of the import duty charged on them. The company employed at the time 100 hands and the factory was ‘lighted throughout with electric light’. Aaron Dennison died in 1895 and his son Franklin took over his role. In 1905 the company was incorporated and became the Dennison Watch Case Company Limited. The Dennison Watch Case Company Ltd. failed in 1967 due to insolvency and the factory in Birmingham was closed. There are stories that Dennison was involved in early waterproof watches, but despite searching I have not found any evidence to support this. Did Dennison invent the screw down crown? 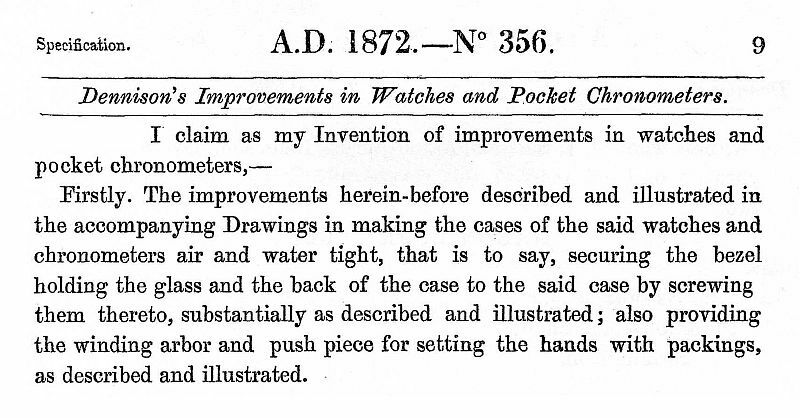 Donald de Carle in "Practical Watch Repairing", in the chapter on Water-Resistant Cases (on page 276 in my copy), says "There are three popular types of [water resistant] button and pendant. The screw button and pendant, originally invented by A. L Dennison as long ago as 1871, is used in various forms today ...". I have seen another reference to this story in an excerpt from an American publication on the NAWCC web site as shown here. The NAWCC library have been unable to trace the publication that this appears in. In "The principles of waterproofing watches" Henry Fried says that Dennison encased watches in waterproof cases as far back as 1871, and says that New York watch collector Louis Romaine has a Waltham watch with one of these cases. The problem with Fried's account is that he says that Romaine's watch has a screw cap, and he illustrates it with a figure from an American patent granted to Ezra Fitch in 1879. Fitch's patented design is different to the design patented by Dennison in 1872 that is discussed in the next section. I am sure that Romaine's watch had a case made in America to Fitch's patent, and that Dennison had nothing to do with it. The use of a screw cap to enclose the crown and seal the gap where the stem enters the case is not really rocket science. It was used on "travellers'" or "explorers'" watches in the 1870s, such as those commissioned by the Royal Geographical Society. It was only part of Fitch's 1879 patent, and I doubt that he would have been able to patent just the cap on its own. These caps were simple and effective, but not a very elegant solution to the problem. A much more effective solution was to use the crown itself as the cap, to arrange for the crown to screw down on the pendant or stem tube. A crown that screwed down onto the pendant was patented by Fitch in 1881, and this appears to have been the first true "screw down crown". I have to say that I am more than sceptical about the claim that Dennison invented the screw down crown. The claim is repeated in several places so it might be thought that there may be some truth in it, but I have found no substantive evidence. I have never seen a Dennison watch case from the nineteenth century with even a screw cap over the crown, let alone a true screw down crown. I think that this is just a tale that grew and changed in the telling and retelling, and that in fact Dennison did not invent the screw down crown. I asked the UK Intellectual Property Office in Cardiff to search for a Dennison patent of around 1871 and they came up with two; No. 356 dated 3rd February 1872 and No. 1113 dated 31st March 1874. These were the only two patents they could find attributed to Dennison around 1871. Patent No. 356 describes a watch with a case made air and water tight by screwed back and bezel, the winding arbor and push piece for engaging hand setting "work in packings so that they may work air and water tight." The drawings accompanying the specification clearly show these packings, and there is no screw down crown there. This design would most likely have have been conceived in 1871 and I take it that this is the patent that de Carle, Fried, &c. are referring to. It is described in further detail below. Patent No. 1113 is for a Up and Down indicator on the dials, showing the state of wind of the main spring, and also a means of letting down a main spring. On 3rd February 1872 Aaron Dennison "of Handsworth, in the County of Stafford, Watch Manufacturer," deposited an application and preliminary specification for a patent for "Improvements in Watches and Pocket Chronometers" which were said to consist of constructing the parts of watches and chronometers so that they "are simplified and perfected, and the cases made air and water tight." (emphasis added.) On 29th July 1872 this application was approved and Dennison was granted British patent No. 356. To make the case air and water tight, in place of the normal hinged bezel, Dennison designed a bezel with an external screw thread which screwed into a thread in the opening at the front of the case, from inside the case. I have circled this in red on the left hand side of the picture. The bezel is item "b" with external screw thread "d". The bezel screws from inside the case into the thread in the front part of the case, part "e" in the diagram. The back of the case "f" had an internal thread which screwed down onto a thread "g" formed on the middle part of the case. The small screw labelled g2 was there purely to give some grip for screwing and unscrewing the back. 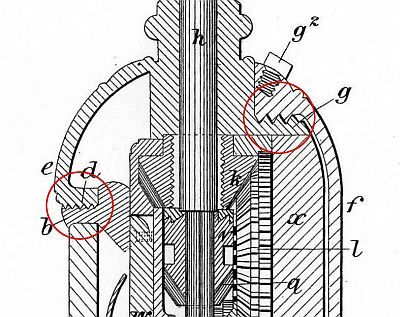 This must have been before Dennison conceived of using the peripheral "coin edge" milling seen on later Dennison screw cases, which is not surprising, the patent was written several years before he started his watch case factory. The winding stem and push piece for engaging the hand setting mechanism were provided with packings of an unspecified nature to make them "air and water tight." Note that these were simple gland packings, there was no screw cap or crown mentioned and I am sure that the story that Dennison invented the screw down crown is wrong. This case was designed before Dennison set up his watch case works, but shows that he was thinking about watch cases as well as watch movements. The patent also covered a mechanism for winding and setting the watch via the crown, using a push piece to put the keyless work into the hand setting position. 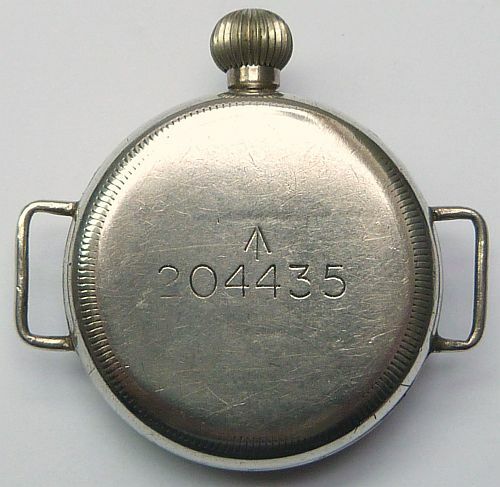 Watch cases made by Dennison which were not made for Waltham are usually easy to identify as they are stamped "Dennison Watch Case Co.". 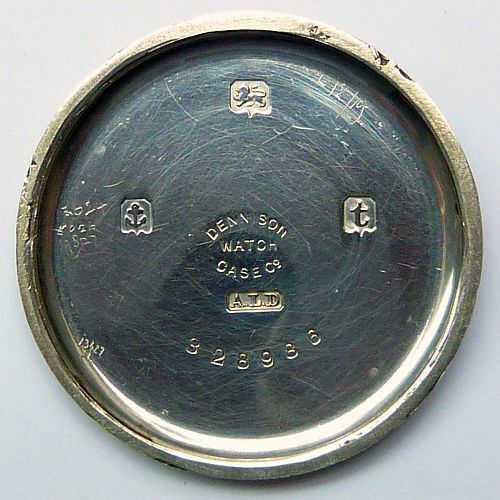 Gold and silver watch cases were also stamped with Dennison's registered sponsor's mark ALD or A·L·D in order to be sent for hallmarking - the assay offices required the sponsor's mark to be composed of the two or three initials of the "responsible person" at the company, a company name or trade mark was not acceptable. 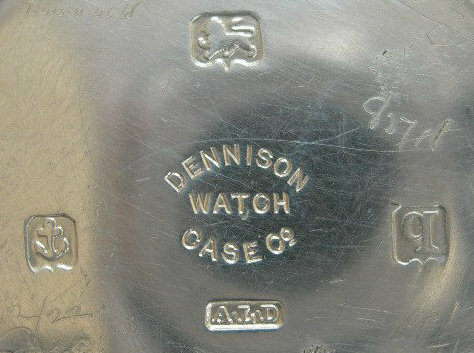 The picture to the left shows a silver case marked with both the Dennison Watch Case Co. and Dennison's A·L·D sponsor's mark. 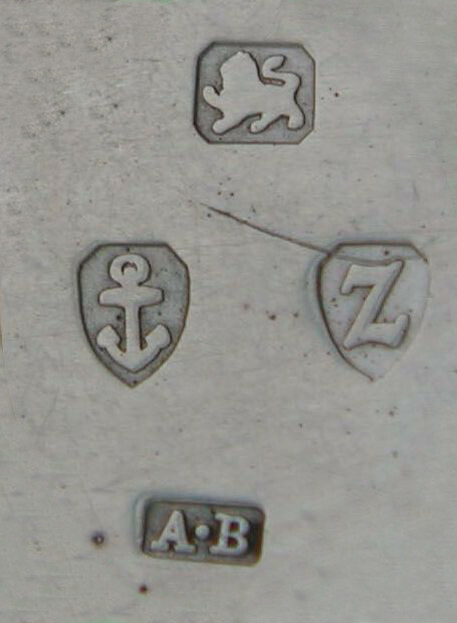 It has the anchor mark which the Birmingham Assay Office stamped on native (i.e. not imported) items, the lion passant, the walking lion, indicating the fineness of the silver as sterling, and the date letter "q" for the Birmingham Assay Office hallmarking year of 1915 to 1916. Dennison made two grades of gold and silver watch cases, "standard" and "special"; "special" indicating thinner material. Dennison also made gold plated or gold filled watch cases. Gold-filled, also known as "rolled gold" or "rolled gold plate" is a composite material where thin layers of gold are bonded with heat and pressure to a core of base metal such as brass. The thickness of the gold plate determines how long the item will last in normal use before the base metal shows thorough, and is usually much thicker, and therefore longer wearing, than electro plated gold. Because these cases are not solid gold they are not hallmarked. "Sun", with inside and outside layers of 14 carat gold, guaranteed for to wear for 25 years. "Moon", with inside and outside layers of 10 carat gold, guaranteed to wear for 20 years. "Star", the layer on the outside of the case 9 carat gold, guaranteed to wear for 10 years. The inside of the Star case, which of course was subject to less wear, was electroplated for further economy. A mark consisting of three symbols, a radiant sun, crescent moon and a star, was stamped on many Dennison cases, including cases made of nickel. This mark does not appear to indicate any specific type or grade of material, it seems to have been simply a trademark. 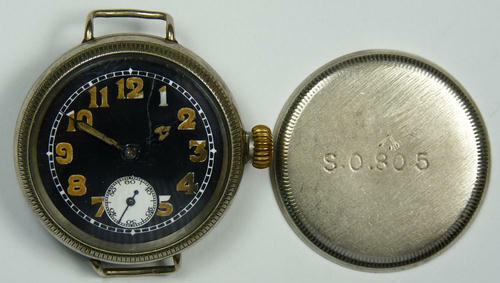 Towards the end of the Great War the War Department began to issue wristwatches such as the one shown here. The "pheon" or broad arrow on the case back denotes it as War Department property. The watch has a screw back and bezel case made from nickel, and the movement was made by the Swiss ébauche manufacturer A Schild. You can see a picture of the movement on my Movements page. The substantial "screw back and bezel" case of the watch is made of nickel, and so it carries no hallmarks or sponsor's mark to show who made it, but the case has several very distinctive features; the milling that gives a grip when unscrewing the back and bezel, the flattened pumpkin shape of the crown, and the large diameter stem tube that is cut away at the back and front to allow the bezel and back to screw down. The silver case is clearly from the the same manufacturer as the nickel case discussed above. The milling that gives a grip when unscrewing the back and bezel and the large diameter stem tube cut away at the back and front to allow the bezel and back to screw down are the same. The large onion crown is a recent replacement for the original flattened pumpkin crown which was missing when the watch was found. The inside of the back of the silver case is clearly marked with Dennsion's trademark and sponsor's mark, and there can be no doubt that both cases were made by Dennison in Birmingham. 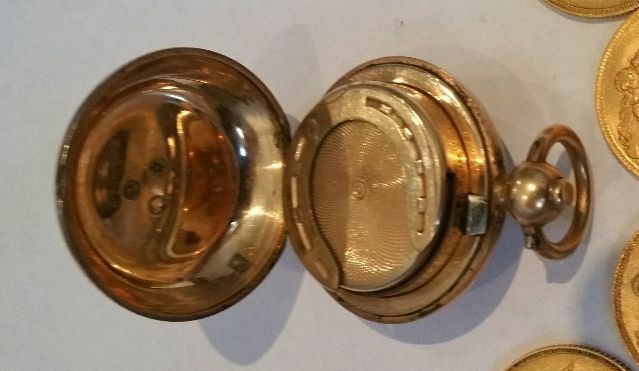 These Dennison screw wristwatch cases usually have a very thick mineral glass crystal rather than the unbreakable crystals that were fitted from 1916 onwards to Swiss wristwatches aimed at service men. This suggests that either someone in the British War Department wasn't happy with unbreakable crystals for some reason, or that the supply of these crystals was restricted to Swiss watch case manufacturers and not exported. The same cases in silver with Dennison marks are seen quite frequently without the military broad arrow, but silver cases with the broad arrow are uncommon. A nickel case was perfectly serviceable for military use, and was rustproof, so the extra cost of a silver case was not justified by military requirements. Most officers watches purchased with their kit allowance were silver, but these did not carry the pheon of War Department property. The advert here appeared in an April 1915 edition of Land & Water magazine and showed that Dennison were making these screw cases from at least 1915, well before the official War Department trials began. The case in the advert seems to be an early version of the screw case that was used for the military issued watches. It has the same milling on the bezel, but the crown doesn't appear to have the large diameter pendant or stem tube of the later cases. The advert proclaims that this Dennison case is "the Original Screw Case". 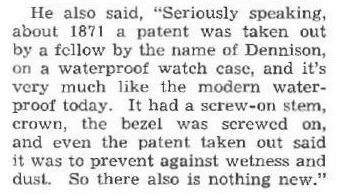 There is no further detail to back up this claim, but Dennison did patent in 1872 a case with a screw back and bezel, although the bezel was screwed into the middle part of the case from inside, not outside as in the watches here. There is more about this early waterproof watch design on my page about waterproof watches. 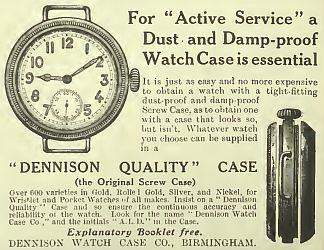 The advert also states that "Whatever watch you choose can be supplied in a 'Dennison Quality' case." This is rather puzzling because almost all wristwatches in Britain at the time were Swiss imports and most came into the country complete with case - it seems to imply that people would get the case of a Swiss wristwatch changed by a jeweller, which is unlikely. An alternative explanation is suggested by the fact that these Dennison adverts often appear in the magazine next to an advert for Waltham wristwatches. There was a very close relationship between Dennison and the UK branch of the American Watch Co. of Waltham. In fact, the Dennison watch case factory may originally have been set up in the 1880s by or in close conjunction with the American Watch Company of Waltham to manufacture cases for Waltham movements imported from the US. It was common in America for watch movements and cases to be made to standard sizes, and a retail customer could then choose which combination of movement and case he desired, which would be fitted together by the shop keeper at the point of sale. It may be therefore that the Dennison advert meant you can have any Waltham watch movement you choose in a Dennison case. These Dennison screw cases were not used only for Waltham movements, they are also seen with Swiss movements, often Tavannes / Cyma, who were the manufacturers of the movement in the silver case. Presumably these movements were imported from Switzerland bare or uncased, and may have been cased at the Dennison factory in Birmingham. The Waltham movements that these screw cases were originally designed to accommodate movements had typical American negative set keyless work. Swiss movements fitted to these cases are also usually (always?) also seen with negative set keyless works. Stainless steel began to be used for watch cases in Switzerland in the early 1930s, partly because it was cheaper than gold or silver which was an important consideration during the Great Depression, and partly because it was a new ‘wonder material’; more attractive and more durable than nickel or ordinary steel. The Dennison Watch Case Co. Ltd. registered ‘Denisteel’ as a trademark for watch cases on 17 April 1934. Dennison sovereign case Image courtesy of and © Steve J.
Philip Priestley's book on Dennison (Ref. 1) contains descriptions of Dennison sovereign cases. These are cases to hold gold sovereign £1 coins, with either one or two tubes for holding the coins. It is said that they were made in gold and silver, but they were also made in rolled gold plate. The image here is a single tube version in 14 carat rolled gold plate guaranteed for 20 years. The coins go under the horse shoe retainer, pushing down the plate which is spring loaded. Philip Priestley does not say when these sovereign cases were made, only that they were made ‘between the wars’. Gold sovereigns were withdrawn from circulation in Britain on the outbreak of the Great War in 1914 and did not return to circulation after the war. Within days of the outbreak of the war in August 1914, the Government asked that all gold sovereigns be handed in at the nearest post office in return for paper £1 Treasury notes. The gold was used to pay international debts to finance the war effort. By the summer of 1915 gold coins were no longer a regular part of British money, and by the end of the war around £100,000,000 of gold had been withdrawn from circulation. This ended the use of gold coins in Britain as a regular part of the circulating money, although until 1918 the Royal Mint continued to make small numbers of gold coins for the Bank of England's gold reserves and international payments. If these cases were to hold British sovereigns, then they must have been made before 1914. If they were made between the wars, then since there were no British sovereigns to be put into them, they must have been either the right size to take an alternative coin that was in circulation, or exported to Commonwealth countries where sovereigns remained in circulation. Australia, Canada and India continued to mint their own sovereigns after this had ceased in the UK. A correspondent Steve J., who contributed the picture here, has seen a Dennison sovereign case dated 1910 to 1911 by a Birmingham Assay Office hallmark, confirming that these were made before the Great War. Philip Priestley's book on Dennison (Ref. 1) contains descriptions of Dennison powder compacts. There were three models, the 200 was for loose powder with puff and mirror, the 150 and 350 models had proprietary inserts of powder, puff and mirror. All models came in 10 year rolled gold or sterling silver, the 150 and 350 also came in 9 carat gold. The lids came in a wide range of engine of engine turned finishes, or enamels of animals on sterling silver. Five enamels are illustrated in the book, a wild duck in flight, an Irish terrier in profile, and heads of an Alsatian dog, a fox terrier and a fox. Priestley, Philip T: "Aaron Lufkin Dennison, an industrial pioneer and his legacy", NAWCC, 2010.